This is the heartwarming moment PETA workers rescued a dog after finding it stranded and alone on a porch amid floodwaters caused by Hurricane Florence. 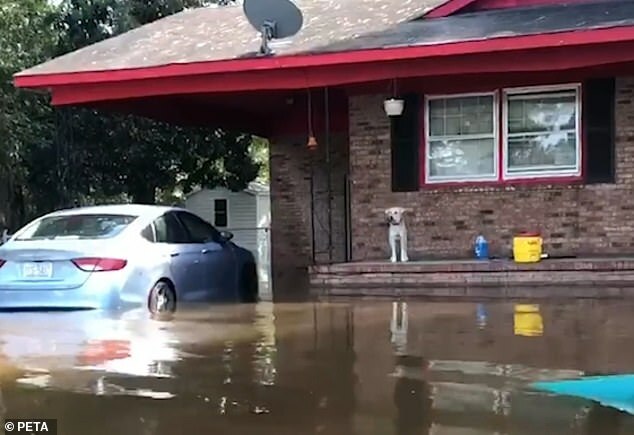 PETA said it found the ‘terrified’ animal outside a home in Lumberton, a town in North Carolina that was inundated with water after the river Lumber broke its banks. Staff took the dog, who is a male, to a staging area set up by emergency workers so that it could be moved to a nearby shelter.